Jacksonville, Florida: Predator Group and Break Speed are proud to announce a partnership in developing the next generation Break Speed application for iPhones, iPads, and Android devices. Over the past year, as the Predator R&D team finalized and tested the new BK3 break cue, a unique relationship and partnership formed with Break Speed developers Paul Nettle and Craig York. The relationship began with Predator testing the application alongside it's own speed measurement equipment and the Iron Willie robot, following a number of testing sessions, the Predator R&D team found the application so accurate that a partnership in pool science began. Break Speed was featured live at the 2010 US Open 10-Ball Championships in Las Vegas on May 21, 22. We're not talking about a paid advertisement here. We were asked to provide the first live break speeds ever to a professional event. And we did it with a phone! How does it work? It's like magic! 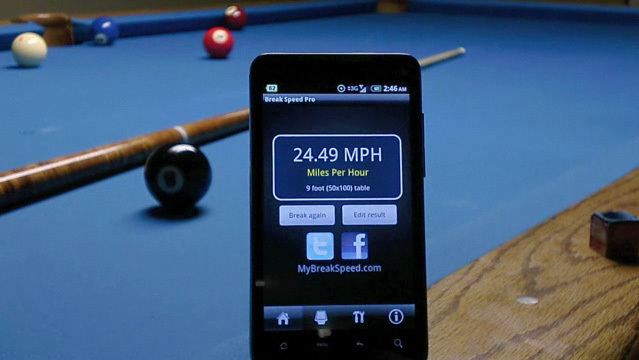 Break Speed calculates the distance automatically when you select your table and cue ball position. Time is calculated by listening to your break shot very carefully to find the exact moments in time where the cue tip hits the cue ball and where the cue ball hits the rack. The player of the decade Mika Immonen showed me this at the 10 ball US open and from there I knew I had to own it... It actually is so responsive and accurate I could barely believe it. Truly a great product. If you play pool - get this. You will not regret it. Does it work? It definitely does. I took Break Speed to the pool hall. People changed their plans for the day and were queuing for their turns until the place was closed. It's a no brainer if you have a iPhone. I saw this used today at the pro event and was very impressed. WOW!!!!! THIS IS PROBABLY ONE OF THE COOLEST APPS IVE EVER SEEN!